I remember growing up how I wanted to be a firefighter and save people’s lives. I didn’t care about the danger involved, as I was too young to understand the risks and hazards. In light of somewhat recent events, firefighters have become even more legendary and celebrated than ever before. Flash Point: Fire Rescue is designed by Kevin Lanzing and published by Indie Boards & Cards. It is a cooperative (or co-op) game that has players working together as a team to put out fires, snuff out smoke, remove hazmat materials and rescue people and even pets from the blaze before the structure collapses. In typical co-op fashion, you all win or you all lose. – together. The base set comes with a double-sided board that allows for some extra variability right out of the box. The set-up is a little fiddly since, through die rolls, you randomly place the initial fire tokens, hot spots, hazardous materials and POI markers (victims) which are placed faced down on the board. 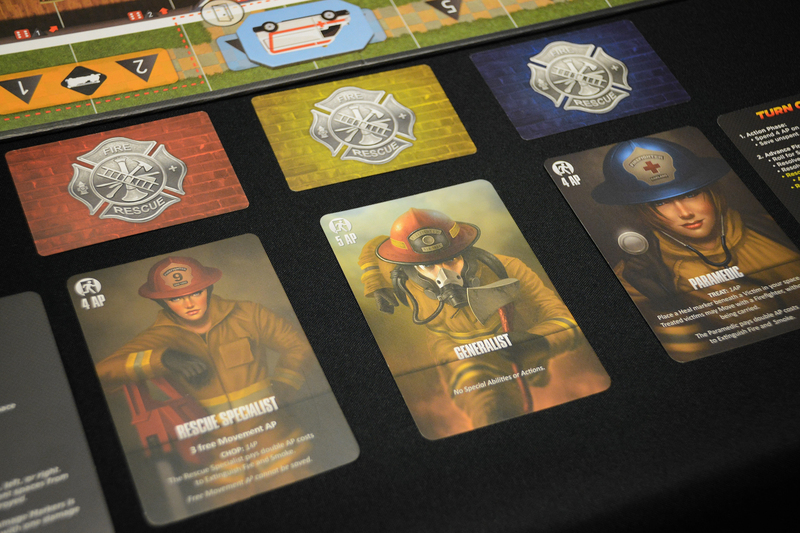 In the solo game, you can choose how many responders you wish to play with. A good starting game is at least three. Each responder has a different special ability or, to be more accurate, specialty that can be utilized in certain situations. One may be more adept at putting out fires, while another is better at rescuing victims and still another may be better at chopping through walls. On each responder’s turn there are three “phases.” First, you will spend the action points assigned to that particular character. Action points (APs) may be used for movement in and around the building, extinguishing smoke or fire, drive the fire truck or ambulance around the board, firing the deck gun into a quadrant of the board to put out fires opening and closing doors, and picking up victims. Unused action points can be banked and used in a subsequent turn. In the second phase, you “advance the fire.” Rolling the dice randomly seeds a smoke token that could possibly flashover and become a fire, cause an explosion, or even a shockwave that causes damage to walls that are marked with black damage marker cubes. When the damage markers run out (there are 24), the building collapses and you lose the game. As you might suspect, things escalate from bad to worse in this game very quickly. The last phase of a responder’s turn is replenishing the victim markers so that there are three on the board at the end of every turn. 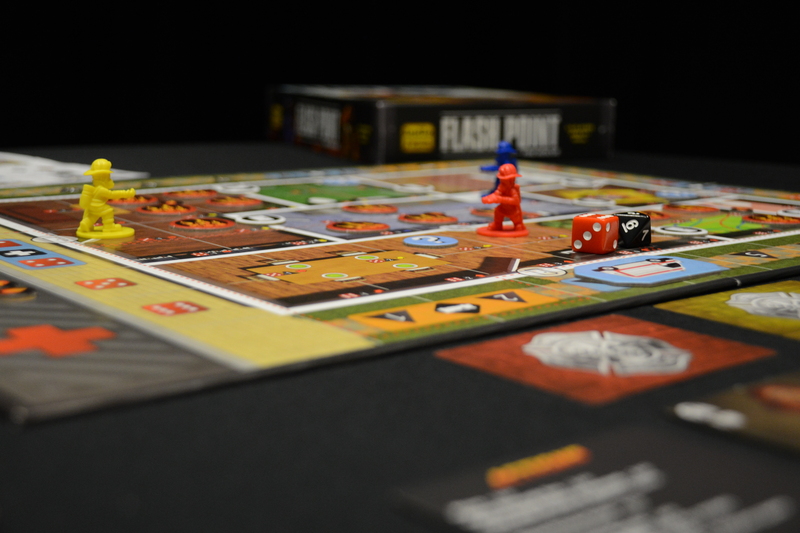 Since most co-op games offer shared information among players, Flash Point: Fire Rescue is a great beginners’ solo game (and co-op game too!) You are the captain of the team developing a plan of attack, deciding who goes in where, who is retrieving victims and who should operate the deck gun to put out large sections of the fire! One of the greatest features of the game is its replayability and variable setup. There are many different scenarios that gamers can play, through the use of available expansions, including high-rise office buildings, brownstones and even a submarine! Each expansion comes with its own set of additional rules for dealing with the specific scenario and conditions. 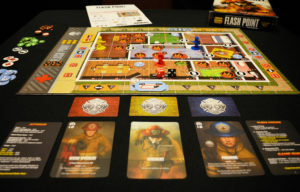 Additionally, you can make the game as easy or as hard as you want depending on how many firefighters you intend to play with, how many fires start in the structure, if there are hazardous materials presents, or how many victims are present in the building or how many of them you need to rescue to win. Optional rules allow for no hazmat materials or not having any use of the deck gun. 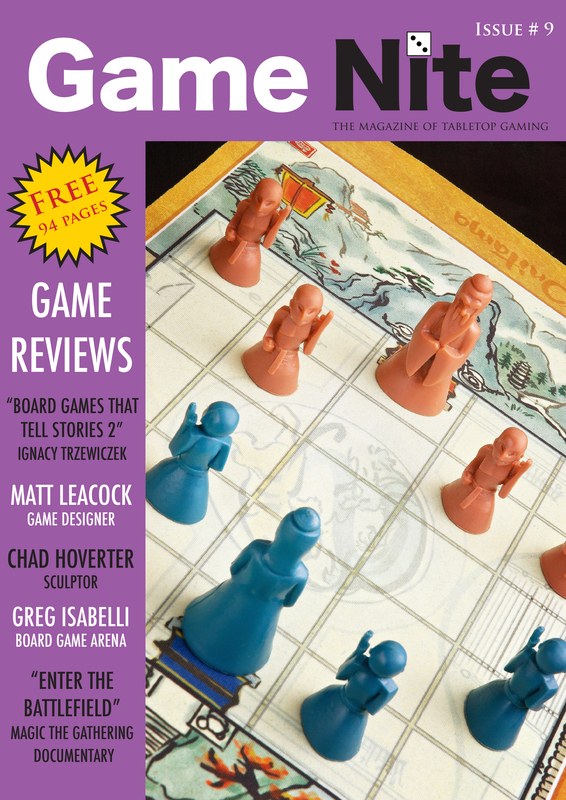 On Boardgamegeek, users have uploaded custom campaign rules as well as user created map boards for more challenging play. As an aside: When playing the game in full co-op mode with others, some “care bear” players might have an issue with game play when they are unable to rescue victims from fire and smoke and some of those victims can be pets. Managing all your responders’ action points and trying to maximize each turn can be a challenge. “Advancing the fire” is relentless and unremitting. The damage counters are finite and run out quickly. It can be a pulse-pounding race to get the last victim out of the building before it collapses on top of your responders or victims left behind. 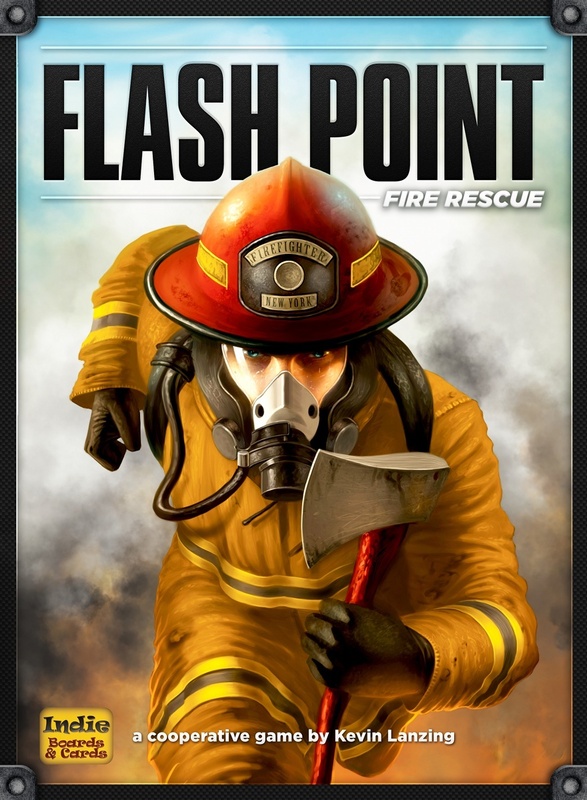 Flash Point: Fire Rescue is a fantastic and tense game. Its cooperative nature makes it perfect for solo play. Although it is considered one of the preeminent gateway cooperative games, its advanced and custom rules allow for a higher degree of difficulty for multiple players as well as the solitaire player.